Every year for the past fifteen years, the beginning of September comes around and it always carries a somber feeling to it. Regardless of the political climate we're in nowadays, we can always look back on 9/11 and remember how united the catastrophe actually made us. This month, in honor of 9/11 and all the people we lost on that fateful day, we take a look at three books that have been written about it. 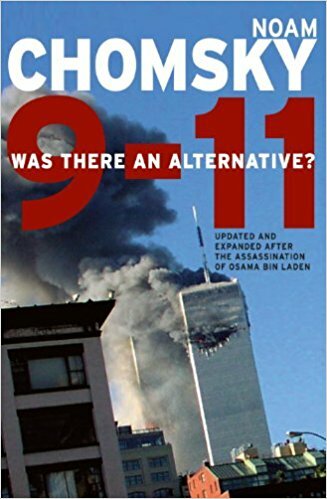 The first one, 9-11: Was There an Alternative, written by renowned thinker Noah Chomksy. 9-11: Was There an Alternative, was actually originally published only two months after the attacks on 9/11. It offers a series of essays and interviews from Chomsky that paints the picture of how many of us felt in the immediate aftermath of the terrible bombings. A product of Harvard University, Chomsky has been an important philosophical and political voice for many years. Beginning with his thoughts on the Vietnam War, Chomsky has written extensively on US foreign and domestic policy on everything from anarchism to Isreal-Palestinian conflicts. He is known as a "paradigm shifter", a man who excels at changing people's minds. In 2011, Chomsky released an updated and extended version of his renowned book, including a new essay that explores how US foreign policy up until the killing of Bin Laden in May 2011, shaped the landscape which ultimately led up to 9/11 and other acts of extremism. The second book on our list, Perfect Soldiers: The 9/11 Hijackers - Who They Were - Why They Did It, takes a look, one at a time, at the men who were the main players in hijacking the planes that did the damage on 9/11. Terry McDermott, a correspondent for the Los Angeles Times, wrote this book because he thought that the media was painting the hijackers in a light that made them look like they were master criminals. McDermott aims to dispel this idea, showing that the hijackers were actually very unremarkable men. McDermott gets first hand information, at times directly from family members, as he tries to get to the bottom of what motivated these hijackers to commit the atrocities that they did. Lastly we have, Ghost Wars: The Secret History of the CIA, Afghanistan, and Bin Laden. Ghost Wars is purposely last on this list because it paints such a perfect portrait of all the little intricacies that occurred in order to make 9/11 possible for Osama Bin Laden. Steve Coll takes us on a journey that goes back further than we would have thought necessary, beginning with the Soviet invasion of Afghanistan in the 70's. It goes into perfect detail, treating real life people like characters in a fiction novel, as they fight a proxy war in this once relatively peaceful middle eastern country. Coll talks about all the weapons the CIA supplied to the groups which were supposed to fight the Soviets, the training that Osama Bin Laden received in order to make him an effective player against the Soviets, and finally his disappearance and subsequent manhunt. It is hard to believe that Bin Laden was very well known to the CIA, especially because almost nobody knew his name before 9/11. In fact, an operation to assassinate him almost took place prior to 9/11, when the CIA knew that an attack was already imminent. Overall, Coll does a terrific job of showing us everything that went on behind the scenes. Even if you aren't at all interested in 9/11 or history at all, read this book. It will completely change your perspective and scare you too. It is truly frightening to know how much is going on behind the scenes. We hope you have a safe and pleasant 9/11 as we remember the terrible attacks that occurred in 2001. Regardless of your plans, these three books are as good a place as any to start if you're interested in learning more about the events that made 9/11 possible. If nothing more, it will inform you, perhaps more than you really wanted to be informed in the first place.